I want to tell you stories about Honduras. It's a struggle for two reasons -- first, because the daily details of life are starting to push our Honduras experience to the back burners. This happens after every mission excursion, after every international trip, after every time of passionately focusing on the kingdom of God in any form, whether local or global. The immediate, overwhelming focus on the kingdom in this time and this place begins to fade and get diluted by immediate concerns. It's frustrating, because you can feel it slipping away. The second reason is that even as the immediacy of the experience slips away, it is still overwhelming to take nine days of cross-cultural experience and sum it up. Yesterday I worked for a couple hours to put together a fifteen minute powerpoint slide show of Honduras trip pictures, and it brought so much back. Sunday, our first day at Manuelito, we got to worship with the kids and their leaders in their dining hall, called a "cocina." 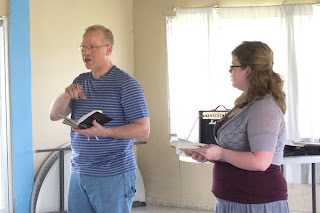 I had the privilege of preaching, and Erica translated for me. It was very gratifying to work together with her, each of us using our best skill to bring God's word in an understandable way. 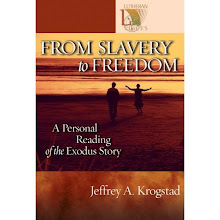 The focus of the sermon was that Jesus is the "friend of sinners" from Luke 15. Nearly all of the kids brought their Bibles -- whatever level they use -- to worship. Whether Beginner's Bible or a full translation, each one did their best to focus and follow along. It was very impressive to see! Monday we got to work. 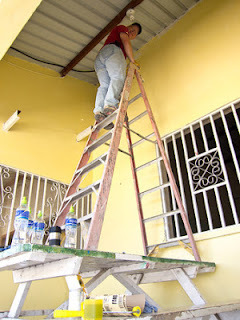 One of our biggest tasks was painting the school, getting it ready for the opening of classes on Friday after their winter break. 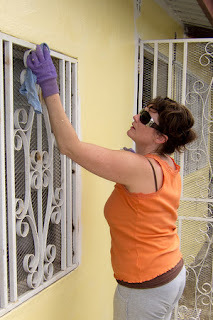 Here Angie is touching up the first coat of paint around the windows on the preschool wing of the school. Not everyone likes heights, so I got to paint some hard-to-reach trim in the entryway. Not quite sure why, but several of the team and a few of the Honduran teachers gave me funny looks while I was doing this. Backing up for a moment, on Sunday afternoon we walked into Talanga and climbed a high hill on the north end of town. 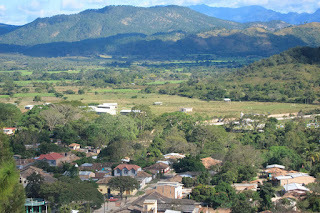 Looking south across Talanga you can see the light-colored roofs of the Manuelito buildings and the open area around them in the center of the image. It's good land with a lot of potential both for agriculture and as a building site. 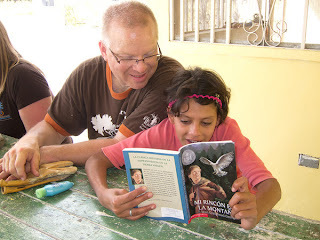 People from Central sponsored library books in Spanish. 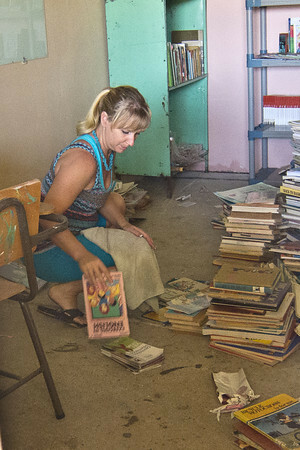 Here Denine is going through books that had previously been donated, trying to pick out the best of the best for a revamped library in the school. By the end of the week, the Spanish language books donated from Central had become the cornerstone of a new library that can be a real resource for teachers and students. 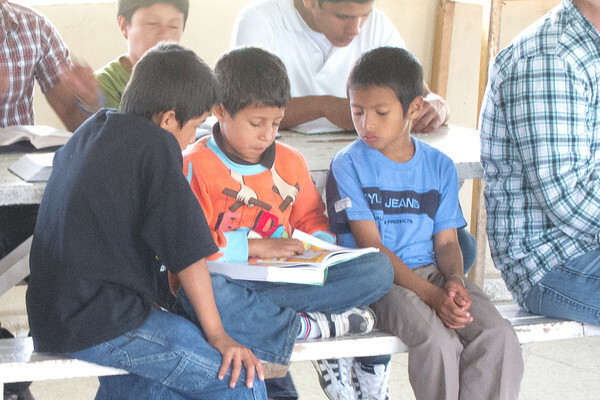 Often the kids at Manuelito are at loose ends for something to do after classes and chores, and many of the books we brought can provide hours of mind-expanding entertainment. Here Johanna and I are taking a look a book while I take a break from painting. We're reading the first few paragraphs of My Side of the Mountain, one of my favorite books as a child. On Friday, after a long week's work, we helped to host an open house where the people of Talanga were invited to Manuelito to celebrate the opening of school. 22 new students from the community are joining the Manuelito kids for school this term. 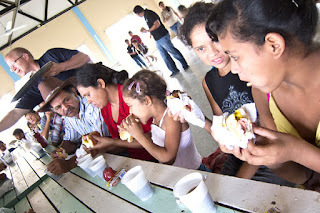 Here many of the new kids and their families are enjoying hot dogs and Coke provided by our team. I feel a little like I've been run over by a truck. It was worse day before yesterday. I have been developing a traveler's cold -- that icky cold you get from being short on sleep, off your routine, sitting in airplanes with lots of people ... it's a recipe for disease. I'm hoping that ten hours of sleep last night helped me turn the corner. We'll see. To catch you up, I just got back Sunday night from a week in Honduras with my family and six other people from Central. Sinus congestion seems a small price to pay for the privilege of going on this kind of a trip! We visited the Manuelito Project, a residential school for children who have been rescued off the streets. The PR slogan of the school is "Los Niños no deben vivir en la calle" -- or in English, "Children shouldn't live in the street." Seems simple enough, but thousands of children are picking through garbage in Tegucigalpa and other places every day, living and sleeping in the streets. Many of these children have parents who are simply not caring for them because they're so absorbed in their own problems -- where to get drugs and how to afford them, for example. Others actively abuse their children. These situations become unspeakable in a hurry. Manuelito has about 40 kids who have been rescued off the streets, given a safe place to sleep and appropriate relationships with caring adults. They are provided with food and an education. It's an amazing ministry. I'll tell you more about it -- and what we were privileged to do there -- in the next few posts.